I have been slowly working on my hexagons again. I have a number of Pink ones done and have started to working on Purple now. I have a baggy of purple Hexagons prepared and ready for more stitching tonight as I watch TV. 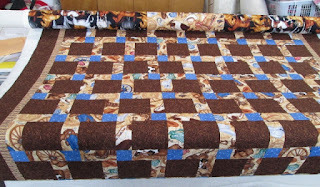 I have added today's post to Kathy's Slow Sunday Stitching. I thought I would show you a quilt I did for a special customer. 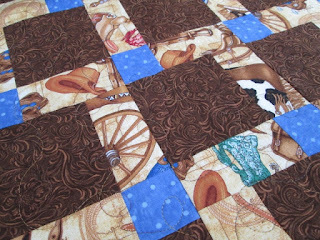 This was done by Wendy and it is her very first quilt. My mom and dad had Wendy and her husband visiting from Australia this past week. They came to Canada in the winter to see what our winter was really about. They had great weather. No cold snap or big dump of snow or a great big frost over night. It was warm and sunny most days. My husband took them horse riding across the lake. They walked on water. Frozen of course. They took the horses though some tough snowdrifts. They also snow shoed, went for a ice walk, a dog sled ride and snowmobiling. Anyway, Wendy wanted to learn to quilt. After the top was complete, I did the longarm quilting. Wendy had most of the binding hand stitched when she left for home. You can see the great western fabric in the close up shot. Great job for her first quilt. Love your little hexies! And a wonderful first quilt for Wendy! 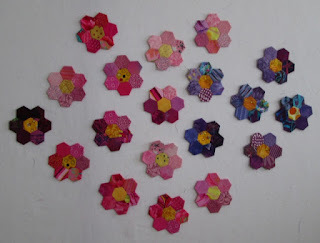 Your hexie flower garden is so pretty! Enjoy every slow stitch today! Yes, I agree, that is a great first quilt. Love your hexies, too. Where did you get the inserts... assuming you are using some. I'd love to make a Grandmother's Flower Garden for each of the grands. Great first quilt. Sounds like they had great weather and a wonderful experience in the snow. Love your flowers - very springy. Your hexies are looking very nice! Perfect first time quilt project too.